McGill has received a Communauté bleue designation for its commitment to eliminating the sale of single-use water bottles on campus by the end of May 2019 and increasing access to public drinking water. The recognition, presented at a joint event with the City of Montreal on Friday, March 22, coincides with international World Water Day. It also marks one year since the University first committed to eliminating the sale of plastic water bottles on its campus. In the time since the announcement, McGill has successfully worked with its vendors to ensure plastic bottles will not be sold on campus past the deadline. “We have a global water crisis,” said Maude Barlow, author, activist and honorary chairperson of the Council of Canadians at the event. “There is no place on earth ­– including Quebec, including Canada – that is immune to it. “At the same time in the world, we are creating a plastics nightmare,” Barlow continued, saying that 91 per cent of plastic water bottles are not recycled. 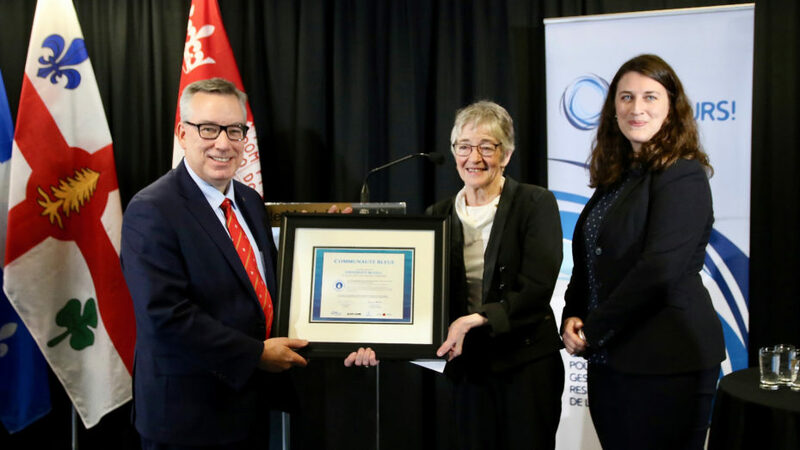 The Communauté bleue designation is conferred by Eau Secours, a non-profit group whose mission is to promote the protection and responsible use of water. McGill and the City of Montreal are the fifth and sixth group to hold such a designation in Quebec, while McGill is the first Canadian university to receive the recognition. McGill’s campaign to phase out the sale of single-use water bottles on campus has also won a French Speaking Green Gown Award for Ecological Transition of the Campus. The award was one of six presented by the French Ministry of Ecology last February through the Campus Responsables initiative. The prizes, distributed annually, reward universities and colleges “operating inspiring projects around sustainability.” The jury who determined the winners of this year’s prizes paid particular attention to “the societal benefits, the innovative potential, and the originality of the approach” of the projects chosen. The French Speaking Green Gown Awards are open to postsecondary institutions in France, Belgium, Switzerland, Luxembourg and Quebec. Eliminating the sale of plastic water bottles on campus is expected to reduce consumption of over 85,000 bottles annually. “There is a growing international movement towards the elimination of plastic, and we wanted to contribute in our own way,” McGill’s Office of Sustainability’s director, Francois Miller, said of the campaign. To ensure the success of the campaign, Ban the Bottle has also secured funding from the Sustainability Projects Fund for the installation and updating of 30 water fountains in strategic, high-traffic areas on campus. More than 60 fountains across both campuses will also be clearly marked with floor stickers, giving community members easy access. The Office of Sustainability has also worked with event planners on campus to reduce the number of bottles distributed. Those efforts have already resulted in a decrease of approximately 5,000 bottles distributed, with a decrease of another 2,000 expected within the next year. “While many often think of this as a campaign to stop selling single use plastic water bottles, we see this as a campaign to increase access and awareness of our high-quality free municipal water,” said Amelia Peres, Vision 2020 Coordinator from McGill’s Office of Sustainability. A series of blind bottled water versus tap water taste tests held by the Office of Sustainability last fall showed that members of the McGill community had no discernible taste preference for bottled water when directly compared to municipal water. You can watch the video below. Students’ Society of McGill University Environment Committee Chair Caroline Lou worked with the Office of Sustainability and SSMU’s food vendors to implement the phase out. She said most people she has spoken to throughout the process have been supportive of the campaign. Lou continued that when students first arrive on campus, they remark that there is already a culture of using reusable water bottles, so eliminating the sale of single-use plastic water bottles altogether is set to further cement those habits. The sale of new reusable McGill water bottles for $5 at various food vendors across campus also simplifies the steps community members can take towards making McGill more sustainable. It’s back to the future. When I was a student at McGill in the 1970’s there was no bottled water. We drank from the water fountains. Montreal tap water was and is safe to drink. Then everyone gave into the fad of bottled water. Eau de Lavabo has always been good in Montreal. The McGill Reporter is McGill University‘s journal of record. Looking for more news, videos and expert opinions? Try the McGill Newsroom. Looking for our archives? Visit the McGill Reporter archives.